Percutaneous stereotactic radiofrequency rhizotomy (PSR) is a minimally invasive procedure performed to relieve pain caused by trigeminal neuralgia, glossopharyngeal neuralgia, and cluster headache. Medications often provide initial pain relief, but may become ineffective or cause serious side effects. PSR uses a heating current to destroy some of the nerve fibers carrying pain signals to the brain. The patient will now feel some numbness in the area rather than pain. Figure 1. Trigeminal neuralgia is extreme, shock-like pain caused by faulty firing of the nerve. 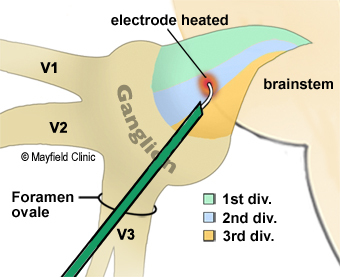 During PSR, an electrode is passed along the cheek through a hole in the skull to reach the trigeminal ganglion. Once the exact area triggering pain is located, a heating current selectively destroys some of the nerve fibers. trigeminal neuralgia: an irritation of the fifth cranial nerve causing severe pain that usually affects one side of the face, normally in the forehead, cheek, jaw, or teeth. glossopharyngeal neuralgia: an irritation of the ninth cranial nerve causing pain on one side of the throat near the tonsil area that can radiate to your ear and the angle of the jaw. cluster headache: attacks of severe pain on one side of the head behind the eye that last 30 to 90 minutes and recur one or more times a day at the same time usually for 4 to 12 weeks. PSR can provide pain relief for many patients with trigeminal neuralgia, glossopharyngeal neuralgia, or other neurological diseases (e.g., cluster headache) when medications become ineffective. PSR can be effective in treating patients of all ages including those with multiple sclerosis and those with some types of tumors. Patients often choose to undergo PSR because it poses lower surgical risks than those of a major operation such as microvascular decompression (MVD). Although facial numbness results, PSR is one of the most effective procedures because it provides lasting pain relief with few risks of serious side effects. PSR is performed by a neurosurgeon as an outpatient procedure in a radiology department or an operating room. A history and physical is performed to assess your overall health condition. Several routine tests (e.g., blood tests, electrocardiogram, chest X-ray) may also be performed. In the doctors office you will sign consent forms and complete paperwork to inform the surgeon about your medical history (i.e., allergies, medicines, anesthesia reactions, previous surgeries). Discontinue all non-steroidal anti-inflammatory medicines (Naproxin, Advil, etc.) and blood thinners (coumadin, aspirin, etc.) 1 week before the procedure. Patients are admitted to the outpatient clinic several hours before the procedure. No food or drink is permitted past midnight the night before undergoing PSR. The surgeon will give you specific instructions about taking your medications the day of the procedure. There are 5 steps of the procedure, which generally takes 1 to 2 hours. Several points are marked with a pen on your cheek, which is then washed with an antiseptic. Sterile drapes cover your neck and chest. Your will receive a shot of atropine to help dry your mouth. A nurse assists the surgeon during PSR in checking your blood pressure and heart rate and delivering medications through an IV in your arm (Fig. 2). Figure 2. A nurse delivers anesthesia to a patient during PSR. The surgeon will adjust the current that destroys the pain-causing nerve fibers on a radiofrequency generator (A). The x-ray monitor (B) shows a view of the brain from the fluoroscope (C). 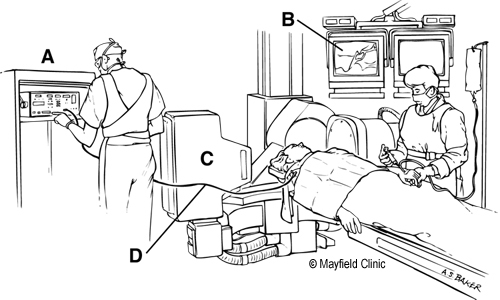 The patient's arms are secured onto the narrow table and a grounding wire (D) is attached. As short-acting anesthesia is given, you will feel a slight burning sensation as you fall asleep. 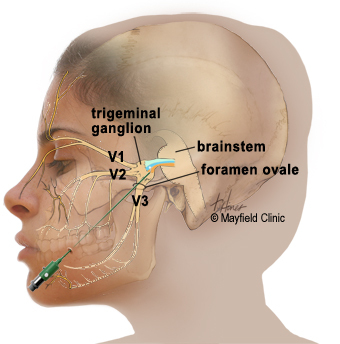 For trigeminal neuralgia, the surgeon guides the electrode introducer through your cheek into an opening at the base of the skull, called the foramen ovale, where the mandibular division (V3) of the trigeminal nerve exits the skull (Fig. 3A). Correct placement of the introducer is verified by x-ray. Figure 3. (top) The surgeon guides the electrode introducer through the cheek, into the foramen ovale, and beyond the ganlion to reach the nerve root fibers. (bottom) By advancing the electrode and rotating the curved tip, the surgeon locates the specific division of the trigeminal nerve causing pain. For glossopharyngeal neuralgia, the surgeon inserts the introducer into the skull base at the jugular foramen where the glossopharyngeal nerve exits. During this step, you are awakened to help the surgeon identify in which trigeminal division the pain occurs. A low current of electricity, stimulating the nerve, reproduces the location of the pain. Based on your feedback, the surgeon inserts the electrode so that tingling occurs where your painful attacks are located (Fig. 3B). You will receive a mild anesthetic again to block any pain or discomfort. While you are asleep, the surgeon passes a heating current through the electrode. This current destroys the portion of the nerve that transmits pain and disrupts the pain-producing signal (Fig. 4). Figure 4. Short controlled bursts of heat are applied to selectively destroy portions of the nerve. You are awakened to help the surgeon determine if the heating current has disrupted the pain. Areas of your face are tested for sensitivity by needle prick. Based on the amount of pain or numbness you feel, the surgeon determines how much of the nerve should be treated. Steps 3 through 5 may be repeated until the desired pain relief is achieved. After the procedure, you will recuperate in a hospital room for 4 to 6 hours. An ice pack, placed on your jaw, reduces swelling caused by the operation. Patients go home the same day. While adjusting to the numbness, you should be careful when shaving, eating or drinking hot foods/liquids, and chewing. A soft diet is often recommended for the first few weeks. Dentures, if used, can be worn at any time. Patients taking anticonvulsant or pain medication for trigeminal neuralgia prior to PSR will be weaned off the medications according to a schedule to decrease risk of withdrawal and side effects. Eye care is important. Do not rub your eyes. Use 2 eye drops three to four times a day in the affected eye. Inspect your eye daily for signs of redness, irritation, or blurring of vision. If any of these conditions occur, notify your surgeon and eye doctor. Perform jaw exercises at least 4 times a day for 2 weeks, opening your jaw against the resistance of your hand. Eat slowly and avoid tough foods. You may find it helpful to chew on the opposite side of your mouth. Avoid foods or fluids that are very hot or cold. Avoid biting your lip on the numb side of your mouth. Use caution if shaving your face with a safety razor. Meticulous mouth care is important. Use dental floss, rinse your mouth after meals, and inspect your gums daily for irritation or ulceration. For trigeminal neuralgia, 98% of patients have immediate pain relief after PSR. About 20% of those who undergo PSR experience some recurrence of pain within 15 years; about half of these patients will require medication or undergo another procedure to control pain. For glossopharyngeal neuralgia, 90% of patients have immediate pain relief after PSR. In patients with vagoglossopharyngeal neuralgia from neck tumors, 70% of patients can expect pain relief or improvement after PSR. Open rhizotomy is the treatment of choice for patients who experience vagoglossopharyngeal syncope. For cluster headache, almost all patients have some pain relief after PSR. Only 62% of those experience long-term pain relief and will require medication or another procedure to control pain. PSR works best in treating pain behind the eye, but is not as effective in treating pain that radiates to the temple and ear region. Regardless of the surgery that is performed, good pain control rather than complete pain relief is expected. If pain recurs, inform your doctor. Excellent results can be achieved by percutaneous procedures, especially PSR, with less risk of operative complications. Healthy patients with pain recurring after a prior percutaneous procedure are best treated by microvascular decompression (MVD). A repeat percutaneous procedure or radiosurgery is considered for patients who are medically unhealthy. Patients who have recurrent trigeminal neuralgia in an already numb area rarely benefit from repeat percutaneous surgery, but pain may be relieved by microvascular decompression or complete section of the sensory and motor root (neurectomy). For trigeminal neuralgia, numbness, the most common side effect of PSR, is necessary for pain relief. Numbness usually occurs in the cheeks, gums, teeth, or tongue. Dysesthesia (troublesome numbness) is reported in 7% of patients after PSR. The loss of corneal reflex is reported in 6% of PSR procedures, primarily in patients with V-1 nerve pain. Complications (e.g., bleeding or infection) are rare. Other possible side effects include blurred or double vision, as well as weakness in the jaw (e.g., making chewing difficult); these symptoms usually resolve within 6 months. Some patients may develop fever blisters that will heal in 12 weeks. For glossopharyngeal neuralgia, common side effects are hoarseness, vocal cord paralysis, and dysphagia (difficulty in swallowing). Controlled PSR for ninth and tenth cranial nerve neuralgia is more difficult than for trigeminal neuralgia. PSR should be restricted to patients with cancer pain who already have swallowing problems and vocal cord paralysis. For cluster headache, because the nerve pain originates in V1, major sensory loss is associated with increased risks of keratitis and dysesthesia that can be up to 12%. For this reason, balloon compression may be worthy of consideration for the treatment of cluster headache. Taha JM, Tew JM Jr, Buncher CR: A prospective 15-year follow-up of 154 consecutive patients with trigeminal neuralgia treated by percutaneous stereotactic radiofrequency rhizotomy. J Neurosurg 83:989-993, 1995. Taha JM, Tew JM Jr: Long-term results of radiofrequency rhizotomy in the treatment of cluster headache. Headache 35:193-196, 1995.
electrode: a conductor that carries current. It is passed through a hollow needle called the electrode introducer. fluoroscope: uses x-ray or other radiation to view structures in the body. ganglion: a group of nerve cell bodies. rhizotomy: section of the nerve roots for the relief of pain. 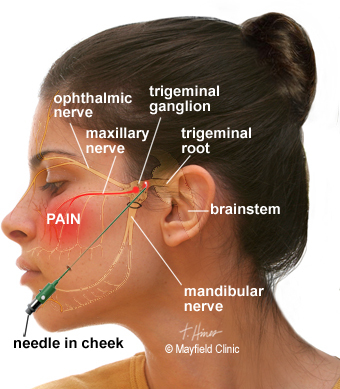 trigeminal neuralgia: a painful disorder of the fifth cranial nerve, called the trigeminal nerve. Irritation of this nerve can cause intense pain that usually affects one side of the face usually in the forehead, cheek, jaw, or teeth. trigeminal nerve: a nerve originating within the brain that supplies feeling and movement to the face. The trigeminal nerve has three divisions: the ophthalmic (V1) division gives sensation to your forehead and eyes; the maxillary (V2) division gives sensation to your cheek, under your eye, around your nose; and the mandibular (V3) division gives sensation to your jaw. radiology department: rooms designed for examining the body by using x-rays. stereotaxis: a precise method for locating deep brain structures by using 3-dimensional coordinates.